I'm happy to report that T.O.P. contributor Ctein's new book is out. 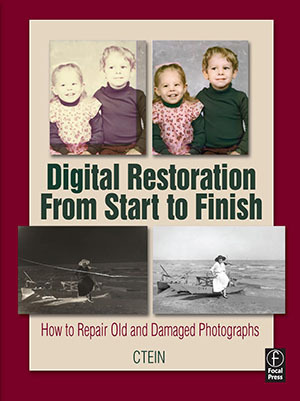 Digital Restoration from Start to Finish is a massive compendium of everything you'd ever need to know about the subject, published by the great old publishing house of Focal Press, which has been publishing some of the best photo-technical books since the 1930s. You can do Ctein a favor by buying an autographed copy directly from him. (He earns a bit more that way.) Oh, and by the way, I'll be reviewing this book soon...somewhere. I'll let you know.